Cartels. The mere word conjures up dramatic Godfather-like scenes. However, the reality of how they operate and are combatted by regulators is often much less made-for-tv, though no less fascinating. One fundamental of economics is that competition is like oxygen for markets. Cartels are accordingly like toxic pollution and firms effectively hamper competition to increase their profits. This can take the form of collusion, price-fixing, bid-rigging for tenders, and market division agreements. The implications for consumers are reduced choice, higher prices, and less pressure in markets to innovate. … And the noble hero whom must be called upon in the open-market’s darkest hour? The ACCC, brandishing an almighty blade – game theory. Yes, game theory. Stay with me here, don’t let your eyes glaze over. The ACCC’s prosecution of the Japanese Yazaki Corporation, aptly illustrates how their whistleblower protections shrewdly utilises the same game theory strategies helping cartels thrive to bring them down from within. Only this year, Yazaki Corporation paid record penalties for breaching cartel offences (price fixing in the supply of car components) since the introduction of the Competition and Consumer Act (2010). The ACCC’s action against Yazaki was largely reliant on evidence from Sumitomo Electric Industries Ltd’s employees. Sumitomo, had been engaged in another cartel arrangement with Yazaki wherein global market share and prices were mutually agreed upon. However, owing to their cooperation and provision of evidence, Sumitomo was granted immunity from proceedings. So, allow me to introduce you to the superhero worthy of a place among all your becaped favourites. To new visitors to the game theory playground: welcome. Game theory is a strand of economics that models potential outcomes to inform tactical decision making in a conflict of interest between parties (or ‘players’ to the ‘game’). 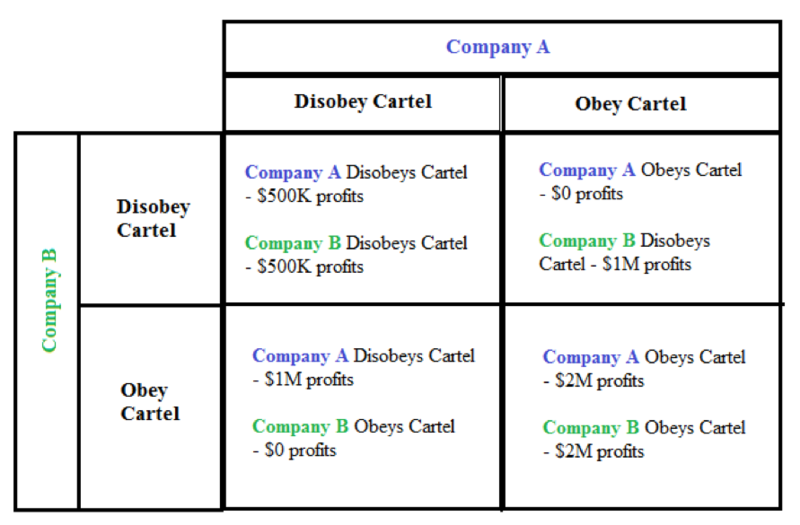 In the context of a cartel, we frame the ‘game’ between two companies, A and B, as the payoffs of collusion in obeying the cartel or disobeying the cartel. For clarity, let’s suppose a firm stands to make $500K in a competitive market by disobeying the cartel and offering competitive market prices but can make $2M if they collude with their competitors to, for example, fix higher prices and thus establish and obey a cartel arrangement. If both firms disobey the cartel they simply operate competitively in the market and are forced to offer lower competitive prices (relative to cartel prices) and thereby earn lower profits ($500K each). Should one firm obey the cartel and the other disobey, the disobeying firm (who is offering lower prices to the agreed cartel price) claims a larger share of the market (theoretically, even the entire market) to earn a higher profit of $1M (2 x $500k). However, the firm obeying the cartel, and thus offering the higher price, loses their market share and subsequently makes less profit than the other firm, or theoretically, no profit at all. On the other hand, should both firms obey the cartel, they both receive the higher profits from charging agreed upon higher prices. $2M in profits per firm in our hypothetical. Clearly, the best commercial outcome for the two firms is to collude, obey the cartel and rake in the $2M profits (at the expense of market competition and by extension consumers). So, the question arises: why isn’t every other firm following suit? Well, firstly, the Competition and Consumer Act duly criminalises it. Game theory provides the second reason: the prisoner’s dilemma. Communication forms the crux of the prisoner’s dilemma, a hypothetical wherein two prisoners are separately interrogated. If both prisoners claimed collective innocence, they would both be saved. However, since the prisoners cannot communicate, they inevitably betray the other out to protect themselves or at the very least share the blame. If communication were possible they’d both undoubtedly agree to exercise their rights to silence. In our context, we can see that if firms can secretly agree not to undercut each other’s prices, they can both rest easy in obeying the cartel and rake in higher profits. Preventing communication between firms is thus one of the ACCC’s crucial weapons in rooting out cartels. The fact that cartels are inherently unstable is yet another pressure point the ACCC can exploit. Firms, notoriously self-interested and profit-minded, are only guaranteed to follow a cartel as long as the benefits outweigh breaking the status quo. The moment they don’t, it’s every Corleone for themselves. Indeed, cartels necessitate a certain level of mutual monitoring to ensure the agreement is being complied with. If the ACCC can tip the scales so the benefits of breaking the cartel outweigh those of colluding, then these alliances will quickly dissolve. Not only does the ACCC try to weed out the faint-of-heart by using the requisite communication between firms as evidence of the offence, another weapon in their arsenal is whistleblower immunity. 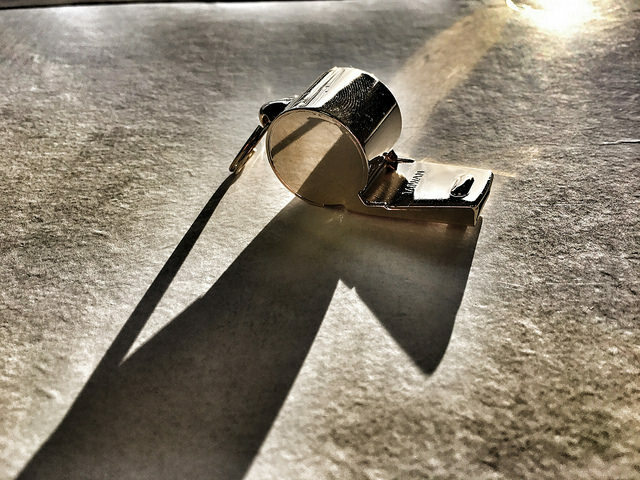 Whistleblower immunity may not sound particularly exciting but it is no less deadly. In practice, any employee or member of a cartel can receive immunity from proceedings by ratting out the rest of the cartel and cooperating with the ACCC’s investigations. So how does this fit into the picture, game theory-wise? To streamline the reasoning, let’s observe this as a ‘game’ between two employees of a cartel, A and B, (they can be employed by the same firm or different ones). Should they both blow the proverbial whistle, though they no longer earn their share of those sweet-cartel-tainted profits, they will be immune from proceedings against the cartel. If one employee remains with the cartel but the other flips, the whistleblowing party will enjoy immunity, and the other will be implicated in the investigation and subsequent legal proceedings. The maximum criminal penalty for cartel offences are a term of imprisonment up to 10 years and a maximum fine of $420k per individual per offence. Not to mention civil penalties up to $500k per individual per civil contravention. However, should both employees remain with the cartel, though they may enjoy the profits of cartel conduct, both employees will risk eventually being implicated, investigated, and ultimately convicted. A triumphant hero’s next bout? If the penalty for cartel conduct (as well as risk of investigation and likelihood of punishment) is severe (and probable) enough, the ACCC’s whistleblower immunity can essentially force a Nash equilibrium wherein members of a cartel will judge whistleblowing as their most advantageous move regardless of what the other ‘player’ chooses to do. Alternatively, through tighter regulation on communication of collusion between firms, the ACCC could theoretically nip cartels in the bud by erecting barriers which exacerbate the difficulty of coordinating cartel cooperation. Either way, the ACCC’s whistleblower approach to dismantling cartels exhibits considerably more bite than one may expect from a regulatory body. Can you hear that? Why, it’s the sound of spooked corporate rabble-rousers jumping ship. Australian Competition and Consumer Commission. (2018, May 16). Record $46 million in penalties for Yazaki cartel [Media release]. Retrieved from https://www.accc.gov.au/media-release/record-46-million-in-penalties-for-yazaki-cartel/. Competition and Consumer Act 2010 (Cth) ss. 45AF, 45AG (Austl). Competition and Consumer Act 2010 (Cth) s. 79 (Austl).